Are Dried Fruits Higher in Sugar? Dried fruits, like raisins and prunes, are convenient because they last for a long time and they're good sources of vitamins, minerals, and fiber. But, if you examine the nutritional information for both fresh fruit and their dried versions, you may see a lot more sugar and calories per serving. So what happens? Does the fruit magically make more sugar during the dehydrating process? Nope. The fruit doesn't develop more sugar when it's dehydrated, but it loses volume, so the issue is how you measure the fruits before you compare them. Fruits are dried in special dehydrators, or they can be left in the sun to dehydrate naturally, and the fruit is ready when almost all of the water has disappeared. The loss of water means loss of physical size, so when a plump, juicy grape becomes a shriveled, leathery raisin, it's a lot smaller. The same thing happens when plums are dried into prunes or when any fruits or berries are dehydrated. When you compare fresh and dried fruit by volume, then you'll always find more sugar and calories in the dried fruit. But if you analyze them piece by piece, the sugar and calories will be about the same. So, for example, one cup of raisins has over 80 grams of sugar while a cup of grapes has about 15 grams or less. Translate that into calories, and you'll see the cup of grapes has about 100 calories, and the cup of raisins has over 434 calories. So you can see what happens when you compare fresh fruits and dried fruits by the cup because you can only fit about 30 to 40 grapes in a one-cup measuring cup, compared to more than 250 raisins. But what if you compare them by quantity instead? According to the United States Department of Agriculture Agricultural Research Service National Nutrient Database for Standard Reference, 30 grapes have about 12 grams of sugar and 48 calories. Thirty raisins have 47 calories and just under 10 grams of sugar. It looks like the raisins lose sugar during the drying process, but that's probably not the case. The natural sugar content of grapes varies by variety and the nutritional value assessments were probably carried out on different types. But, even so, when you compare a raisin to a grape, the nutritional numbers are about the same except for the water. It's important to point out that some dried fruits, like cranberries, are so tart, you can barely stand to eat them, so sugar or fruit juices are often added during the drying process so the resulting craisins can be sold as a snack. 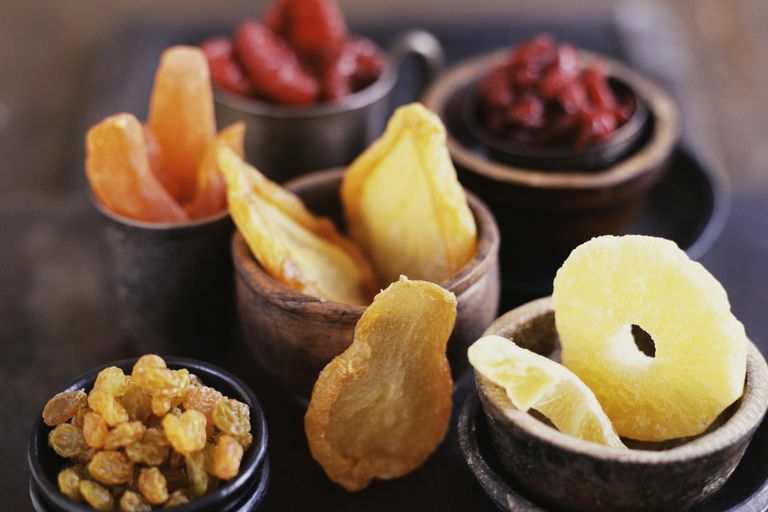 Should Dried Fruits Be Avoided? A healthy balanced diet should include some fruit. Fresh fruit is probably higher in some vitamins, like vitamin C, but mineral and fiber content are retained during the drying process, so there's no need to avoid dried fruit. But if you're watching your weight, you'll need to keep an eye on serving sizes and calorie counts. Make a salad with your favorite dark greens, fresh apple slices, dried cranberries, and a little goat cheese. Or try a spinach, pear, and raisin salad from California Raisins. Get the kids in the kitchen and teach them how to make ants on a log with raisins, peanut butter, and celery. Add dried fruits to hot steel-cut oats for a hearty and healthy breakfast. Use dried fruit as an ingredient in the main course, like chicken tenderloin with mustard and cranberry sauce from Ocean Spray. United States Department of Agriculture Agricultural Research Service National Nutrient Database for Standard Reference Release 28.